The new crazy game of Roberto Fraga! Hi han, Moh, Corner corner, woof woof! All animals dream of becoming the new king of animals. It's up to you to be the fastest to find and imitate the cry of the animal that launches the challenge. But beware ! The challenge is not the same depending on the chosen rule and it is not always easy to find the corresponding animals. This game will make you completely Joomba! 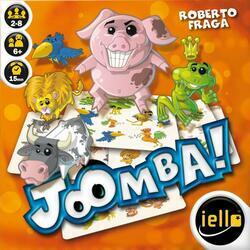 If you like speed games that set the mood, with simple rules, Joomba is for you!